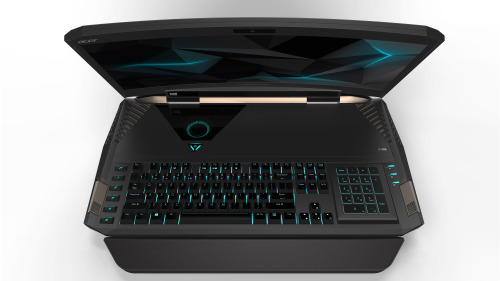 We have seen some overpowered, pricey, gaming laptops recently - but nothing quite as crazy as newest Acer 21-X. It has curved screen. Curved. Screen. Just look at this beast! It’s sporting two GeForce GTX 1080 GPUs. And five fans to cool them down (the grillwork on this thing is a work of art itself). CPU is the 7th-generation Intel Core K-series (which isn’t even released yet!) . Full-size Cherry MX mechanical keyboard with individually adjustable RGB backlighting for each key (this alone caused quite a stir in Remotr’s office - colorful keyboards!). The numeric keypad can be flipped over to become a touchpad. 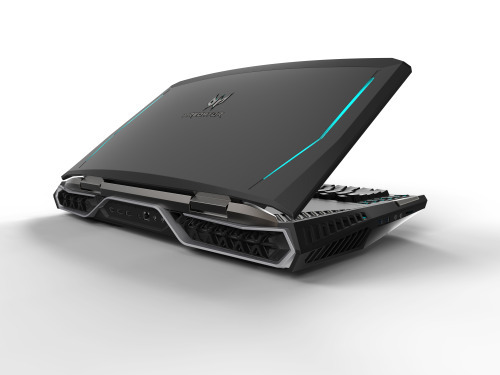 This big boy have enough room for four DD4 slots that top out at 64GB of RAM, Tobii eye-tracking and 4.2 sound system. Price? It’s a secret for now. Just looking at this thing should give any true gamer shivers down his spine. Now excuse me, we have reconsider our choice of PCs we are testing Remotr on.